Mary Perchaluk of Dauphin, Manitoba passed away on Thursday, July 19, 2018 at the age of 97 years. Mary Perchaluk was born on March 30, 1921 in Valley River to parents Maria and Jan Kurdziel. Sadly at age 4 she tragically lost her father. Soon after, her mother re-married Walter Solski who had 10 children of his own. To this family, Mary and her brothers Joe, Phillip and Peter were to be added. But at age 9, she was sent to live with Mike Boyacheck and sons Bill and Steven in Sclater, where she also attended school. Her brothers were sent to Portage la Prairie to board with relative Peter Boyacheck. The boys worked on the farms for room and board. Brother Peter was only 7 years old. Mary was sent back to Sclater for a time and continued school until her brothers told her of a job as a nanny for the Case family in Portage. This turned out to be a good experience for her at the age of 13. This little girl proved to be a very intelligent go-getter throughout her life. Mary went to Gilbert Plains for a short time and continued school along with her step sisters and brothers. After Mary finished school in Sclater, she met the love of her life - John, the store keeper’s son. John courted her by finding excuses to visit the Boyachek farm. One favourite excuse was that he was looking for his black horse. They used to go for long walks. When John & Mary were married they received some cash from presentation, a horse from the groom's parents and a cow from her mother. After 7 years of farming in Sclater, John & Mary moved to Prince Rupert with their lovely daughters Diane and Phyllis, where John worked at the Columbia Paper Co. and Mary cleaned halibut and then she took a job at a department store, where she progressed from a clerk to the position of manager and gained valuable business experience. In 1952, they moved back to Sclater and bought John's parents' General store. It was the center of the community. Twice a week the train brought mail, supplies & passengers. In between running the post office and store, Mary milked cows, had chickens and pigs, huge gardens and a family. She was a good shot and provided many meals of partridge and rabbit. John and Mary operated the store until 1973 when they sold it to the Duck Mountain Company. They continued to run the homestead farm from their house they had built in Dauphin. 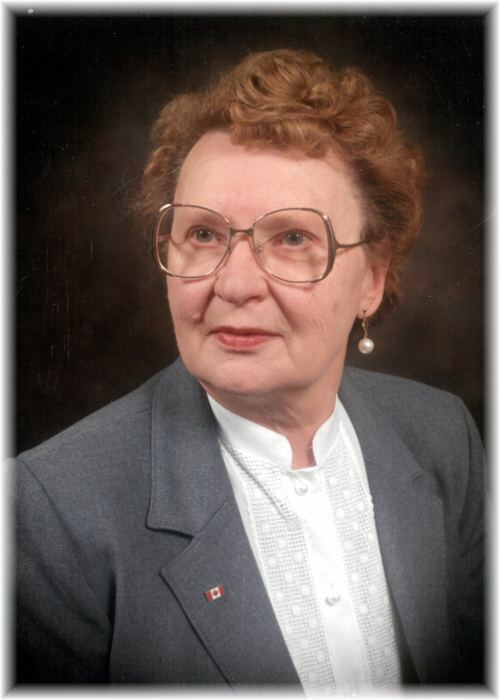 After moving to Dauphin, Mary worked at McKay School and she volunteered at the Ukrainian Festival for many years. She enjoyed bowling with her many friends and mall walking. Crafts were also a favourite pastime including Japanese needle point, beadwork, knitting beautiful sweaters and afghans, embroidering many Ukrainian blouses, crocheting lovely lace bedspreads and more. Together, she and her husband John made many lovely quilts. She loved fishing in the boat with her husband and brother-in-law Peter and caught more fish than they did. She continued to fish at Lake of the Prairies right up to the age of 94. Later unfortunately, macular degeneration put a halt to many of these favourite past times due to loss of her eyesight. She loved to travel and enjoyed a Caribbean cruise and a trip to Cuba. Mary leaves to mourn and cherish fond memories her daughters Diane and Phyllis, grandchildren, Kim, Gail, Tracey and John, great and great great grandchildren; and many extended family members. Mary was predeceased by her husband John. Funeral Service was held on Thursday, July 26, 2018 at 1:00 pm from St. Viator's Roman Catholic Church in Dauphin, MB with Father John Legitimas officiating. Interment followed in Riverside Cemetery in Dauphin, MB . Pallbearers were Adam Boyachek, Matthew Beattie, Jim Perchaluk, Larry Perchaluk, Bob Boyachek, Dave Swanton. Should friends so desire, donations in memory of Mary may be made to CNIB - (Brandon, MB Chapter) 354 - 10th Street, Brandon, MB, R7A 4G1 www.cnib.ca or a charity of one's choice.